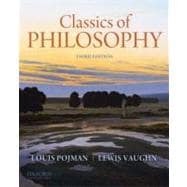 Incorporating the insights of new coeditor Lewis Vaughn, Classics of Philosophy, Third Edition, is the most comprehensive anthology of writings in Western philosophy in print. Spanning 2,500 years of thought, it is ideal for introduction to philosophy and history of philosophy courses. It features more than seventy selections by forty philosophers--along with fragments from the Pre-Socratics--offering students and instructors an extensive and economical collection of the major works of the Western tradition. This volume contains the most important writings from Thales to Rawls; twenty of these are complete works, while the others are judiciously abridged so that little of value to the student is lost. A lucid introduction, including a brief biographical sketch, accompanies each of the featured philosophers. NEW TO THE THIRD EDITION: * Selections from philosophers who were not included in the previous edition --Maimonides ( Guide for the Perplexed ) and Schopenhauer ( The World as Will and Representation )--along with Kant's Critique of Pure Reason * Expanded readings: Aristotle's Posterior Analytics, On the Soul, Metaphysics, and Nicomachean Ethics; Berkeley's Of the Principles of Human Knowledge; and Hume's Treatise on Human Nature * Review questions for each chapter and illustrated portraits of many philosophers * A Companion Website at www.oup.com/us/pojman featuring resources for students (self-quizzes, flash cards, chapter review questions, a timeline, and helpful web links) and instructors (brief reading summaries, essay questions, test questions, and PowerPoint-based lecture slides) Classics of Philosophy, Third Edition, provides students with an extensive view of the major stages of growth in Western philosophy--including its birth with the Pre-Socratics and its contemporary developments--in an accessible format and at an affordable price.